With just over a month of NBA in the books, I decided to round up a couple random stats and put them here. This post went on the silly side of things as I looked at half-court heaves, which are unfortunately not doing too hot compared to last season when I posted a few (a different link for each letter!) thoughts. 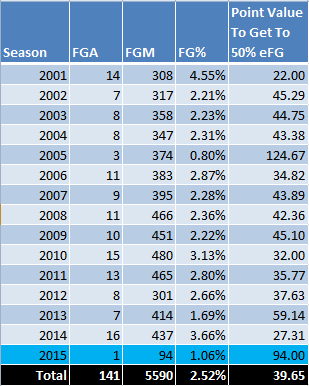 Below is a look at 2001 to 2015’s numbers, via Basketball-Reference’s Shot Finder tool. The numbers are a bit different from previous posts. Since Casper Ware’s half-court shot last season was logged from 46 feet instead of the ~50 that was obvious on film, I gave the Shot Finder a two-foot cushion, increasing the range of shots to 45-94 feet. This isn’t meant to needle Basketball-Reference. Getting exact shot locations and the time the attempt was taken, among other things, is not easy. Anyway, below are the numbers this season. I also added another column looking at how many points the heaves would have to be worth to reach an average of one point per attempt. Four-point line? How about one worth 40 points? If this ever happens, some fans are getting max contracts. 2015 is behind 2014’s pace in made heaves, though. Not too surprising since 2014 was the second-best heave percentage ever tracked, but 2015 is also in contention for the least-accurate ever. It even looks like 2015 is behind 2014’s pace is in attempted heaves, which, I don’t know. I’ll try to remain optimistic. MOAR HEAVES C’MON.